Essential oils are commonly used during cold and flu season for their antiviral and antibacterial properties. And if you think about it, plants create these compounds for a reason – protection! Garden plants (think thyme, oregano, rosemary, lavender), trees (juniper, sage, frankincense) and grasses (lemongrass, citronella) all produce germ-fighting essential oils. These natural compounds are a plant’s immune system. Plants create and use them to fend off insects, bacteria, fungi and other germs. And when we extract the oils, we often use them for the same reasons. What’s the best way to take advantage of oils’ antimicrobial effects? Diffusion. Diffusing oils is the best way to “neutralize air-borne illnesses and enhance immunity,” says David Crow. Cinnamon, clove, thyme, oregano and tea tree are some of the strongest germ-fighting essential oils, and combining them with eucalyptus, lavender, and citrus oils can alleviate symptoms and support the immune system. 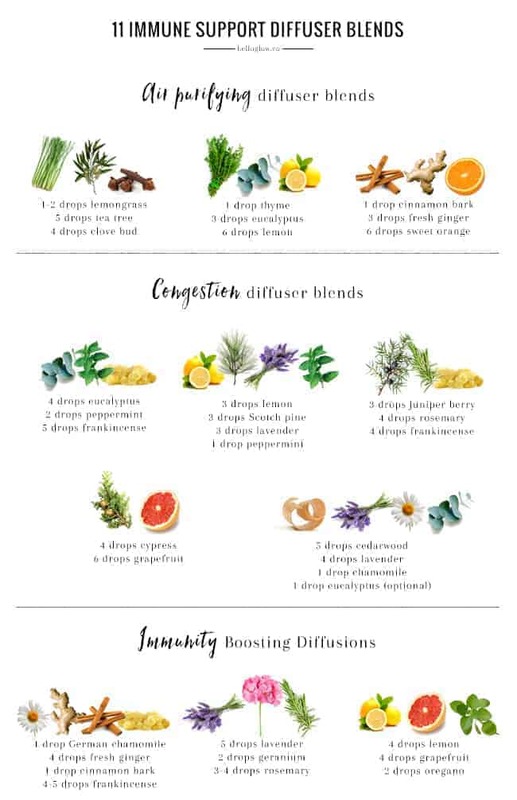 Use these blends to help prevent illness and improve your recovery if you feel like you’re coming down with something. Add essential oil drops to a diffuser to purify your air. Just remember to adjust the number of drops according to your diffuser instructions. Your amazing insightful information entails much to me and I’m obsessed of aromatherapy oils:) Actually all essential oils can help kill bacteria and viruses, fight infection, relieve allergies and alleviate anxiety, stress, depression, fatigue and poor memory. I have been using oregano for almost every day. It has been my own natural home remedy. For flu and cold I diffuse oregano oil mostly in the evening before going to bed. I will get a few leafs of oregano and make a tea and drink at least three times a day. I also diffused it in my basement and feel better when down there. The mold used to bother me and cause me to cough.I use oregano on a daily basis and it has always been wonderful. Fantastic blends. I’m using one of them now for congestion. It’s working well. Thank you!